Author Malcolm Pierce is a former member of the US Army, a long-term employee of a tech company, and an enthusiastic traveler. His novels draw from firsthand knowledge of military service and the diverse cultures of our world. 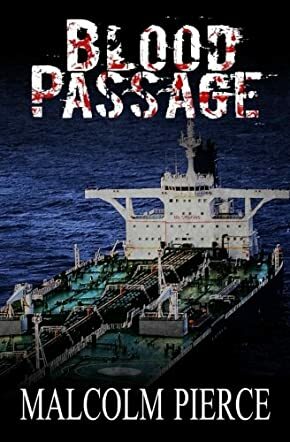 Blood Passage by Malcolm Pierce taught me a lesson: don't judge a book by its cover. Let me clarify that. I have never been drawn to fiction based on military experience, soldiers, murder and mayhem on the high seas. But Blood Passage gripped me in a way few fiction books do. Talk about being surprised. The story line is intriguing: a former military man, Brian Francisco, wakes up on board an oil tanker and has no idea how he got there. His last recollection is falling asleep in his city apartment with his beloved dog, Danny, nearby. Bit by bit, he realizes he's been kidnapped and is now being held under armed guard and is out in the middle of the ocean somewhere, with no hope of escape. Worst of all, he has no idea why he has been kidnapped, where he is headed, and if he survives the voyage, what will become of him once he's on land. Malcolm Pierce takes his protagonist, his enemies, and the reader on an unforgettable ride. The reasons for why this all happened will surprise you, as it did the protagonist. What makes Blood Passage so good? Is it just the clever plot? Not just that. Malcolm Pierce is one skillful writer. He keeps chapters short: super short. He alternates the chapters between his protagonist's thoughts and plans, to those of the ship's captain and his daughter. This necessitates changing the point of view from which the story is told: from first person to third person. Under the pen of a less skilled writer, this could create confusion for the reader. But not so with Malcolm Pierce. Furthermore, despite the hell in which the protagonist has found himself, every so often he reflects on his situation with a subtle, self-deprecating sense of humor. While this tough military man fights for his life by killing people all over the ship, he is simultaneously deeply upset that he has had to take lives to save his own. And once in a while, in the midst of it all, he thinks of his beloved dog and wonders if he'll ever see him again. The reader loves Francisco for his humanity. He is real. This is great characterization. As the reader's tension mounts to an all time high by the ending, Malcolm Pierce brings Blood Passage to a satisfying close. What has Malcolm Pierce got in store in his next book, if he's writing one? I can't wait to read it. First, I'd like to confirm that I will begin working on ERASED, my next book, later this year. 1) This has to have been the best book I have read so far this year. Non stop action from the very first page. I found myself rooting for the main character, I liked how he worried about his dog & how all he wanted to do was survive. I am anxiously waiting to see what the author comes up with for his next novel. 2) This is my first book by Malcolm Pierce. It wont be my last. Rarely does a writer immerse me into a story to the point where i feel I am the character and its MY mission to survive. I probably would answer to the name Brian now :) Well done Mr Pierce. i look forward to your next book. 3) Fun, exciting, non stop. The reason for the kidnapping isn't for any of the usual reasons. Definitely worth the read. 4) This novel was intense. The story line was real, believable, and authentic. Very appealing to all avid readers. The suspense and mystery kept this book in my hand; unable to put it down. If you wonder about what the military mind-set is, this is the novel for you. This book was detailed, but not to the point of losing the readers attention. Today's Middle-East turbulence surely made this a fantastic read. 5) Brain is a strong, fierce, and smart. Not allowing his situation to overcome him he uses his wits and know-how to stay one step ahead of his captors. I loved how he stayed cool in the face of danger and his sheer determination. The synopsis may give you a general idea of the story but you'll never be able to guess all the twists and turns that there are throughout. I thoroughly enjoyed this one reading it late into the night just because I couldn't put it down and had to finish it!